English born Deb Hunt has been a librarian, teacher, event manager, PR executive, actress and journalist. She has worked with Shakespeare in the Park in London, Australian House & Garden magazine in Sydney and for the past five years as a writer with the Royal Flying Doctor Service. Her memoir, Love in the Outback, reveals Deb’s experience of discovering an unimagined land and true love far from the green fields of home. Her latest book, Australian Farming Families explores what it is that binds Australians to the land. Travelling tens of thousands of kilometres, Deb met farming families who are challenged every day by the weather, economic ups and downs and isolation and yet remain passionate and determined. Deb is joining us at the 2016 Batemans Bay Writers Festival in September. We spent five minutes with Deb to find out a little more about her. The summary of your 2014 memoir, Love in the Outback, goes along these lines: “The true story of a tree-hugging vegetarian from a small English village who gave up a job she hated, stopped stalking a man who wasn’t interested and moved to Australia to work for the Royal Flying Doctor Service.” What were some of the culture shock moments in that transition that make you laugh now? I had so much to learn about the Outback. A single property in Australia can be the size of several English counties so it can take a couple of hours to drive across. I could never admit that I used to stop for a nap mid-way through a two-hour drive in England. That was considered a long way! I remember one time I found a mouse at home in Broken Hill so I captured it, thinking I might keep it as a pet or maybe release it. Then I heard about an epic plague of mice causing havoc in town, so I kept very quiet about the one I’d tried to save. And until I lived in Broken Hill I’d never heard of anyone having all their teeth removed when they got married. Apparently it saves having to visit a dentist. Before you came to Australia, did you have any idea of what the RFDS was and how important it was to outback life? My only understanding of the RFDS was through watching that old TV series about the Flying Doctor from the 1970s and I’ve learnt so much since about the incredible work they do. I fully appreciate that tyranny of distance now, which is an ever-present threat in the Outback. I had no idea how vital the service is for survival in rural and remote areas. Your experiences in rural Australia have also led to a collection of true stories called Australian Farming Families. Is it possible to sum up what you learned from them about life on the land? I learnt it takes grit and determination to be a farmer in Australia. It’s not a question of if disaster strike, it’s when. Farmers, graziers and pastoralists cope with drought, fire, flood, debt, disease and the invasion of pests on a regular basis. Add to that the lack of schools, hospitals, dentists, libraries, shops, mechanics and all the other services the rest of us take for granted and you begin to understand how hard it is to operate in a remote area. Yet the people I interviewed wouldn’t live anywhere else; they’re passionate about what they do. Where to next with your writing? 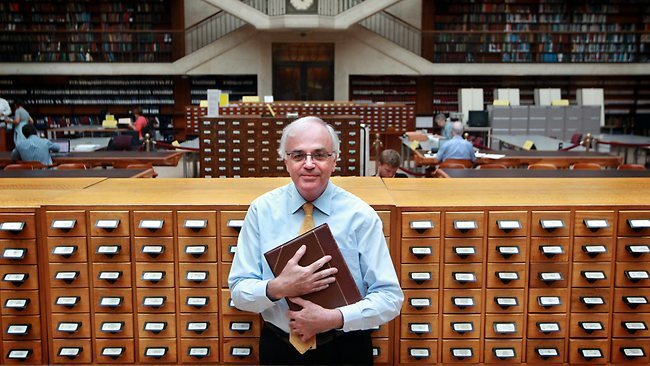 Are you sticking with non-fiction or is there a novel lurking in there? I love non-fiction but I’ve always been an avid reader of fiction so right now I’m exploring an idea for a novel – set in the Outback of course! 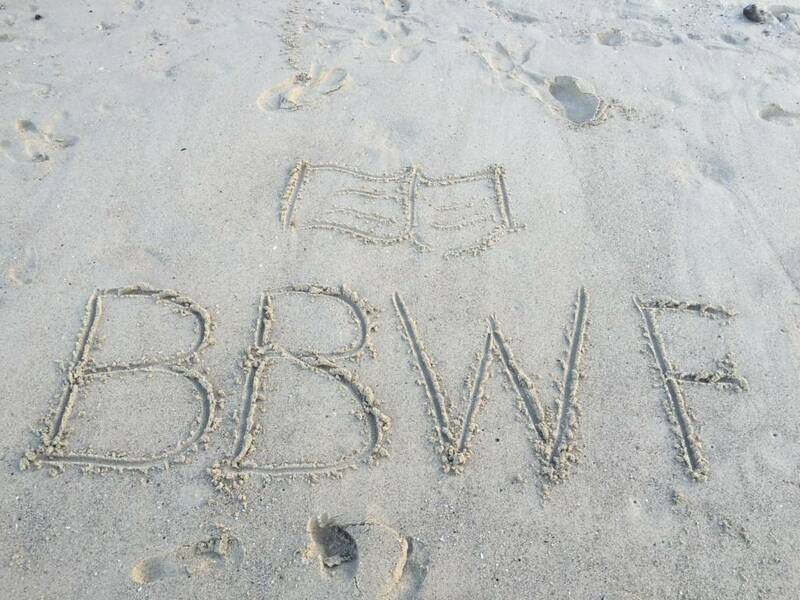 We’re so looking forward to welcoming you to the 2016 Batemans Bay Writers Festival. But what are you looking forward to when you visit in September? You’ve got a great line-up of speakers so I’m looking forward to hearing as many as I can. Tim Fischer was influential during his time as Chairman of the RFDS so I’m really looking forward to hearing what he’s got to say. And I’ve heard the coastline around Bateman’s Bay is spectacular. Deb Hunt (Love in the Outback and Australian Farming Families) talks with Ian Campbell about the important role the RFDS plays on outback life. Four authors, four readings, four sets of literary trivia. Join us for drinks, trivia and book-readings. Authors Deb Hunt, Meredith Jaffé, Paul Hetherington and Rod Jones, give short readings from a work of their choice. In between, tease your brain with four sets of literary trivia. Prizes to be won. How does a writer distinguish memory from fact or determine truths long buried with their teller? Author Meredith Jaffé facilitates a lively discussion with Annabel Morley, Deb Hunt and Rod Jones. Book lovers! Give the Festival a go! We are thrilled to announce an exciting line up for the 2016 Festival. If you haven’t been to a festival before, then give it a go! You will be sure to enjoy the weekend, and if you can’t make it to the whole weekend, then there will certainly be some individual sessions which will appeal. The Festival opens on Friday 9 September with the Honourable Tim Fisher AC talking: Tango in Travel and Travel Writing ― Bhutan to Batemans Bay! 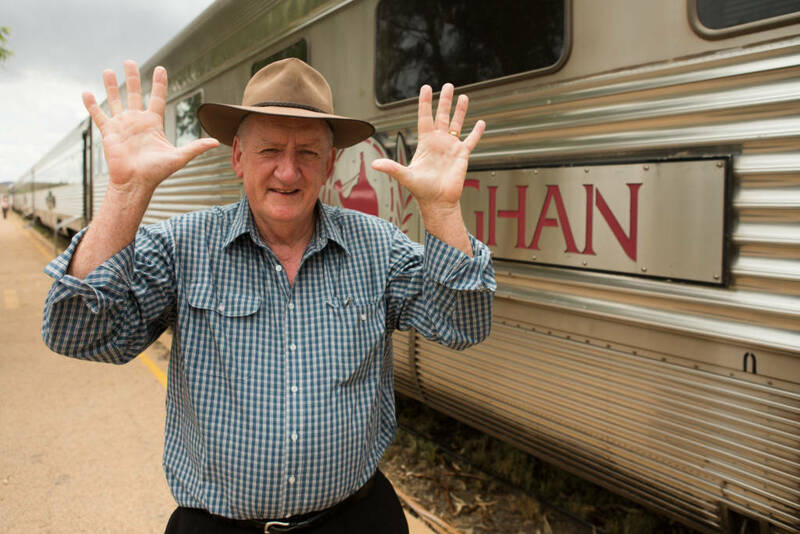 Special guest and former Australian politician Tim Fischer celebrates as he shows the number 10 in Alice Springs during The Ghan 10th anniversary trip from Adelaide to Darwin. Buy a Platinum Pass ticket and this session is free. There are sixteen sessions for book lovers over the weekend as well as five workshops. Here are some of the highlights. For foodies, meet James Viles chef and owner of the two-hatted restaurant Biota Dining, and photographer Simon Griffiths who has worked with celebrated chefs including Maggie Beer and Kylie Kwong. They are joined by Annabel Morley, daughter of the renowned actor Robert Morley CBE. Annabel’s memoir is The Icing on the Cake. Lovers of art cannot miss hearing Darleen Bungey in conversation with Paul Brunton about her biographies of John Olsen and Arthur Boyd. Dr Leah Kaminsky has written the fascinating We’re All Going to Die, a book that asks why some of us fear dying and others embrace it. Award winning journalists George Megalogenis, Malcolm Knox and Mark Dapin discuss the horror and humour of the 2016 election. For lovers of fiction there’s Malcolm Knox author of The Wonder Lover chatting with Ian Campbell. Award winning poets, Sarah Rice, Geoff Page and Paul Hetherington discuss rhythm and rhyme and read from their poems. Deb Hunt talks about her books and the Royal Flying Doctor Service. The festival closes with a Literary Lunch featuring Tim Fischer talking about Turning Points in our Great Country. We are in for a treat! And it all happens at the CoachHouse Marina Resort, Beach Road, Batemans Bay. Bookings are open for all sessions including the Opening Night event, Platinum Pass tickets, individual sessions and the Literary Lunch. Platinum Ticket holders can use their PROMOTION CODE to book 9 SESSIONS, and also as their Seat Discount Code for the Literary Lunch. These codes are available on EventBrite when you access your Platinum ticket information. You can request these be sent to you again here. When you have your Promotion Code, click the button below, Enter the Promotion code, click View Event and purchase your seats. You will be able to select the seats you want, and ‘enter a promo code’ (your seat discount code) to get your discount. Please Note: The Literary Lunch consists of a Two Course Meal with Tim Fischer AC as the Guest Speaker (incorrectly listed as a three course meal in recent newsletter). 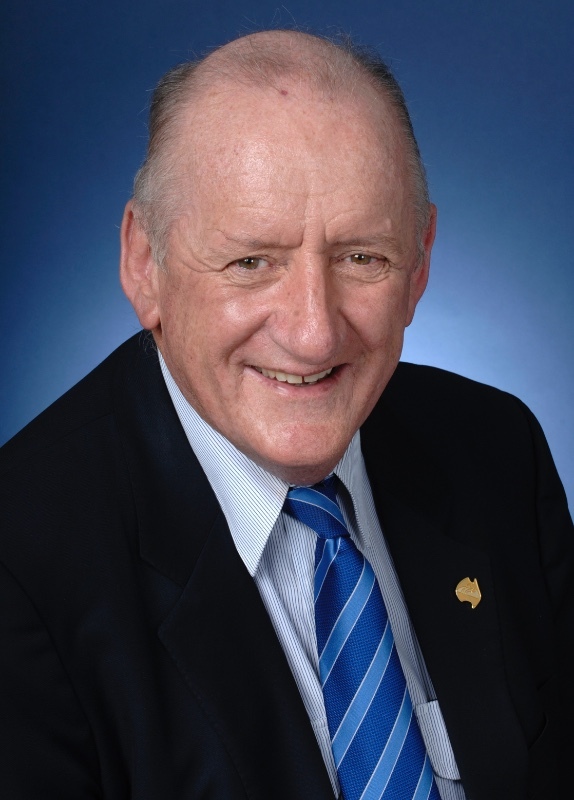 Join consummate and extremely versatile speaker Tim Fischer at the Festival Literary Lunch. Tim draws on his broad range of experience in public and private life to deliver illuminating and informative presentations on everything from Gross National Happiness to Military Civilian Leadership and Infrastructure Excellence. He may even talk about his obsession with trains and travel. More details to follow when the Festival Program is announced. Tickets are currently available for ALL FESTIVAL ACTIVITIES. Click below and purchase your Platinum Pass Ticket or on Ticket Links on every page.